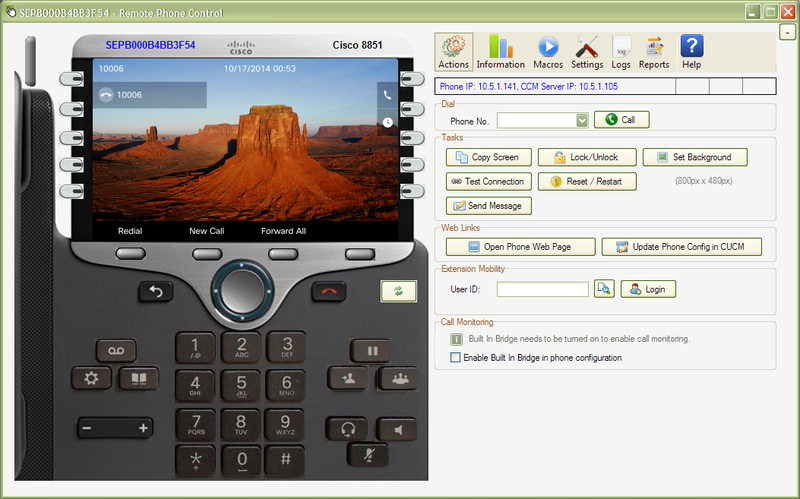 Remotely control Cisco phones from your desk by pressing the phone's keys and viewing the phone’s display as if sitting at the phone. UPLINX Remote Phone Control will send key strokes to the phone (via Cisco JTAPI) and retrieve the screen of the Cisco phone as an image. This image is then displayed on the remote phone control tool. UPLINX has improved the sending of keys and automatic retrieval of screen-shots to optimize usability. Multiple phones can be controlled at the same time and phones appear on your desktop as being in front of you. So you can be intuitively familiar with using the Cisco phone and you can see what the phone user sees to improve support services. 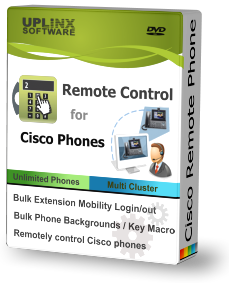 Send key strokes from UPLINX Remote Phone Control to the remote Cisco phone supporting soft-phone keys, conference, hold, transfer, services, directory, all phone buttons and the rocker. Place a call by entering the phone number and pressing the Call button. Smart call monitoring: Play local ring tone by monitoring incoming calls via Cisco JTAPI, flash the called phone button and immediately update the screen which allows the operator to pickup an incoming call. Retrieve the displayed image of the phone's display and save or copy it to the clipboard. Login/out of Cisco Extension Mobility users with device profiles without knowing their password. Send text messages to remote phones with (optional) sound and auto-clear of screen. Set background image. There is also a wizard to perform Bulk Background Images to many phones. View phone settings such as IP address, phone counters, phone logs. Duplicate voice calls to your desk phone by using Cisco Built-In-Bridge for Cisco Silent Call Monitoring. Please view the list of supported Cisco phones.